With the passing of Dieter Schnebel on May 20, Germany lost one of its last links to the post-WW2 generation of composers who built a new paradigm of music after the old ideas had been pulverized beneath the wreckage of war, fascism, and genocide. As a student of the famous Darmstadt Summer Courses for New Music, Schnebel eagerly soaked up the influence of his fellow students Nono, Kagel, and Stockhausen, as well as their spiritual predecessors Ives, Webern, and Varèse. Like many of his contemporaries, he was also deeply influenced by John Cage, and went on to experiment with indeterminate and graphic notation, distribution of sound sources in space, extended vocal and instrumental techniques, and theatrics of the sort that North Americans often associate with happenings and performance art. But Schnebel didn’t always follow the script of the stereotypical European avant-gardist. For one thing, he earned degrees in both music and theology, eventually teaching both subjects and becoming an ordained Lutheran minister. And in contrast with the reputation of some composers as vain and temperamental, Schnebel exuded a gentle, collaborative personality that displayed little trace of Stockhausen-sized ego or Partch-sized shoulder chips. dt 316 is the first piece in a trilogy of a cappella sacred works. The second piece is entitled amn (the vowelless Hebrew rendering of “amen”). This work is longer, about 15 minutes in the linked performance (it starts at 33:24 in the video). This time the text comes from the Lord’s Prayer, once again rendered in multiple languages and sometimes paraphrased. 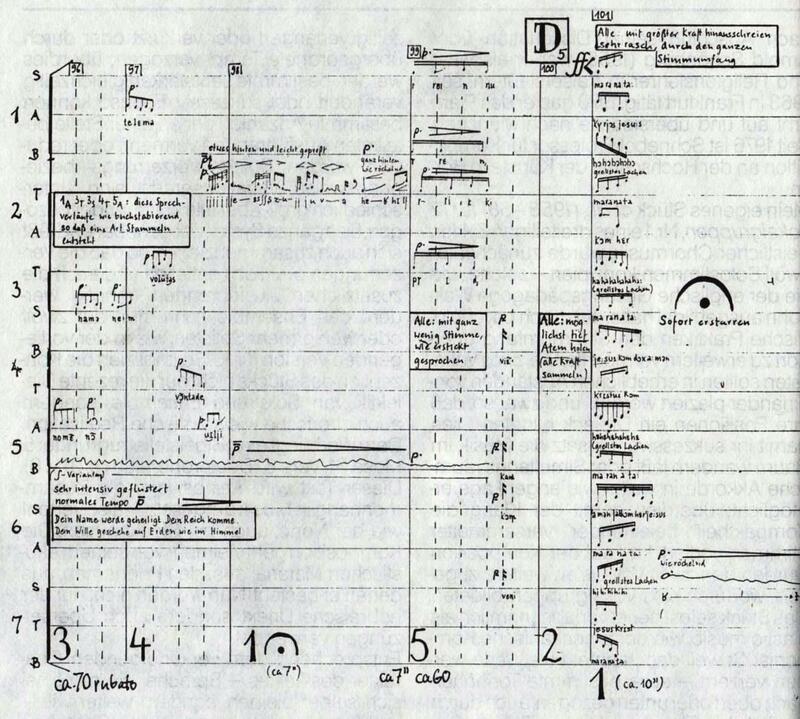 Apart from a few coordinated outbursts (like the one in this score excerpt that corresponds to 42:43 in the video), the 16 solo voices proceed independently in a way that suggests the private nature of personal prayer. Indeed the variety of idioms and vocal techniques heard in the piece suggests an assembly of people from diverse cultures and nations, consistent with the universalist ideals of the Lutheran faith. Such devotion to exploring the full range of human vocal expression can easily lead a composer toward theater, and Schnebel indeed went on to pioneer a hybrid of new music and theatrics that is still influential today. The video linked above is a good sampling. In its use of nonsense syllables, moving sound sources, and strange hand gestures and choreography, it shows the influence of Schnebel’s friend Mauricio Kagel, but also connects with the work of like-minded American contemporaries such as Kenneth Gaburo. Efforts like this helped pave the way for such postmodern classics as Ligeti’s Aventures and Nouvelles Aventures, the new music theater of Meredith Monk and pieces like Mark Applebaum’s Aphasia. These days a piece like Schubert-Phantasie might be called a “remix.” Either way, it’s a clear precedent for two much newer Schubert homages that have been featured at Second Inversion: Eric Wubbels’ Gretchen am Spinnrade and Vladimir Martynov’s Schubert-Quintet (Unfinished). Schnebel’s music took a more contemplative turn in his old age, as evidenced by a pair of string quartets that were recorded by Quatuor Diotima. The beautiful String Quartet “Im Raum” (“in space”) from 2006 sounds like the satisfied musings of a man nearing the end of a fulfilled life. The texture is slow and sparse, punctuated by several musical quotes, most notably the plaintive beginning of Stravinsky’s Orpheus and the similar-sounding opening of Bruckner’s Fifth Symphony. In a live performance there are elaborate instructions for how the performers should move on stage, which explains both the title and the footsteps you hear in the last movement. In the Second String Quartet (2000–07) two actors join the ensemble, reciting numbers and occasional snippets of text in German and English. It reminds me of Crumb’s Black Angels (without the amplification) and Stockhausen’s Helicopter String Quartet (without the helicopters), but it also belies the notion that intellectual Germans can’t write sensual and playful music. Unusually for Schnebel, the music is often beat-driven, with melodic fragments and little repeating riffs emerging from the instruments. But more characteristically, it explores the full range of associations from abstraction to meaning, and even incorporates musical quotations too, including the familiar Tristan chord, which rears its head in the second movement. Even as he entered his 80s, Schnebel stayed active, still exploring, still fascinated by the voice and the sacramental connotations of theatricalized performance. One of his last works is a ritualistic setting of Molly Bloom’s soliloquy from Joyce’s Ulysses. It seems fitting that the coda of Schnebel’s career should come from the coda of the 20th century’s most exemplary literary work. Schnebel with John Cage ca. 1979 (via Croatian Society of Composers). Can one reconcile this eclecticism with the constancy expected of a Christian clergyman? According to his colleague Godfried-Willem Raes, Schnebel “was not very church minded, and I think his idea of god was rather abstract, certainly not prescriptive. However, he believed in the meaning of rituals.” Perhaps the variety that Schnebel sought in his own music expresses a concept of God as embodying the multiplicity of the world and the cosmos. And perhaps Schnebel’s lifelong interest in ritualized performance expresses a human awe and reverence for that same multiplicity.